When Donald Trump destroyed and derided Bush Family heir-apparent, Jeb Low Energy Bush, in the GOP primaries in 2016, eyes turned toward the dynastic Republican family in Texas. Would the Bushes cross party lines to back Hillary Clinton or stick with the Republican standard-bearer? In September, Kathleen Kennedy Townsend revealed that George H. W. Bush said he would vote for Clinton, which the former presidents spokesperson later confirmed. His son, President George W. Bush, noticeably refused to endorse Trump, but his nephew George P. Bush, the Texas Land Commissioner, last week let it slip that his uncle may vote for Hillary Clinton as well. It would prove even more that the CORRUPTOCRATS don’t care if a republican or democrat is in charge, as long as it is one of them. The Dem HATE W but will vote for HRC, the Bush favorite? The BUSHES had their day. That day is over. A new day is dawning in America. The Deplorables have spoken. Michael Savage has been dead on with these elites for decades. I doubted, but Trump has revealed them for what they are. Uni-party elites. It would seal the deal that the Bushes are 100% corrupt. I wish we could deny Poppy lying in state when he passes. He is an enemy of this country and of the rule of law. Go ahead, stupid Laura. Do it. Seal the deal that you are a paid for corrupt witch. No - it would make dumb Dims who don’t know the term “uniparty” stop and wonder if they’ve miscalculated voting for Hillary, ha. I want the Bush’s GONE. I want the Clinton’s GONE. I want the Kennedy’s GONE. It would only help Trump. 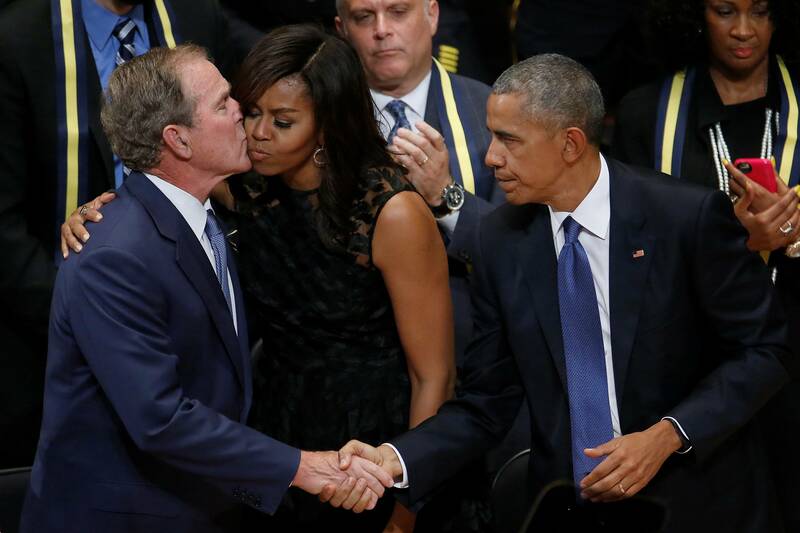 Everything these globalist Bushes have thrown at Trump, hasn't hurt, and has only HELPED Trump. No more Crooked Bushes - No more Crooked Clintons!! I saved all those pictures. However, the article did cause me to lose my appetite. I find it fascinating that the same liberals who have spent the past 30+ years deriding various members of the Bush family as corrupt warmongers and out of touch racists have suddenly decided that endorsements from said family are now a badge of honor. Laura Bush? Name sounds vaguely familiar. Why would I care what she thinks about anything? But it will seal the deal for the DEATH OF THE BUSH FANTASY AND THERE WILL NEVER BE ANOTHER BUSH IN PUBLIC OFFICE. The Bush family are evil satanists like the rest of these people. They are dark people who feed on others. Parasites. They will have someone write you a swell thank you note to make you think they are real humans but at the end of the day they are typical thieves. Er, no. But it might seal the deal for Trump.